Valletta hosted other more refined establishments aimed to cater for the families of British servicemen and the Maltese upper class, and again, men from the Mandraggio formed part of their staff. Although it had a bad reputation, many cap­able people emerged from the Mandraggio. Criminality was not lacking either, although it was common just about everywhere, but possibly more in Valletta due to it being in the capital city. The inhabitants of the Mandraggio did not find help to better themselves but we cannot look back at Valletta and Malta of those times from a modern perspective. Today we have everything and we live a luxurious life, practically everyone is employed, including women, and we have money in our pockets. As a rule, prior to World War II, women and girls did not go out to work, yet some did work as washerwomen or cleaners, either with rich families or in the infamous ‘lodgings’ where sailors stayed during their free time or when their ship was in the dock for a refit. A false belief is that barmaids and prostitutes that operated in Valletta were local girls and women. Many of these females came from the towns and villages. They fell foul of life, sought refuge in Valletta and earned a living ‘offering comfort’ to the sailors. Education was not compulsory, so it is doubtful how many children from the Mandraggio attended school. In those days even children were obliged to find some means to ‘earn a penny’ or perform menial tasks for some small payment. Others were left to fend for themselves and to become scoundrels. Life in Valletta definitely changed with the arrival of the British but the Mandraggio did not change much at all, except there were other venues where one could earn a living; even if not an honest one. Even in the late 19th century, sanitary conditions in the Mandraggio remained antiquated. A number of water hand-pumps were installed in certain areas when the lower fountain was stopped. 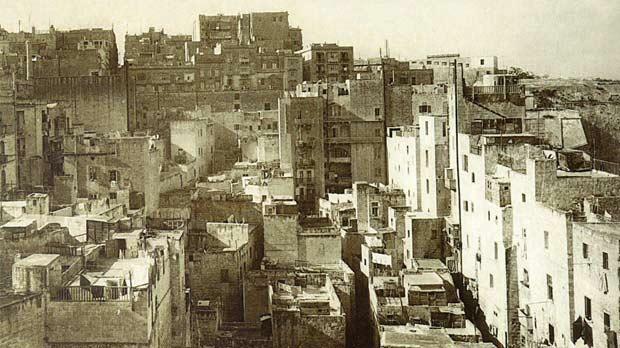 A survey conducted by A. Critien, sani­tary inspector for Valletta after World War I, states that at the time 71 premises in the Mandraggio had water closets, of which only 40, presumably in Strada Mandraggio, emptied in a primitive drainage system that flowed to a pump in an area by the sea known as ‘Il-Cable’. Of these 40 premises, only 11 had piped water. There were also 22 kerreja, a tenement separately occupied by a number of families, where between four and seven people lived in one room. Although one kerreja is supposed to have had 43 rooms, only 22 were rented out and 31 people lived in them. Critien added that by the time of writing, some 53 premises had piped water, although the residents were still using large water cisterns and reservoirs to obtain for water for domestic use. From time to time, Malta was afflicted by epidemics and the Mandraggio was not spared. During the third plague epidemic of 1675-1676, referred to as Il-Pesta ta’ Matteo Bonnici (Bonnici’s Plague), out of the 942 people living at the Mandraggio at the time, 278 were recorded to have died. The population of the Mandraggio varied over time, and the Rollo e state delle anime della Chiesa Matrice di Santa Maria di Porto Salvo states that in 1727, 966 people lived there; by 1737 this fell to 844. The 1813 plague report gives the population of the Mandraggio as being 3,000, which is somewhat high; of these only 99 people were reported to have perished. In the cholera outbreak of 1865, only 20 died out of the Mandraggio’s population of 1,696 residents. The number of inhabitants grew to 2,544 in 1881, but detailed studies conducted in 1888 show that the figures were not accurate as while there were 1,565 people living in the Mandraggio, 976 others lived in its boundaries. The census of 1911 showed that there were 1,814 residents, of whom 1,210 lived in the heart of the Mandraggio, while in 1933, there were no more than 1,000 people living in the area of Strada Manderaggi. This latter figure is probably wrong, but just at the outbreak of World War II, the total number of inhabitants of the Mandraggio was only 1,214. 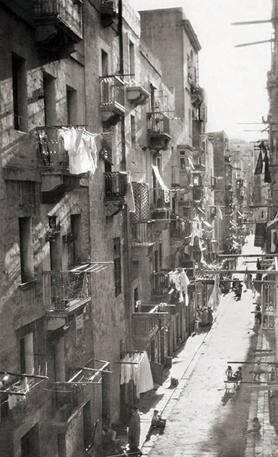 By the beginning of the 20th century, much of the filth that had existed in the Mandraggio had been cleared away. The area acquired the services of two street sweepers who swept the area twice weekly. Rain water and water from the Wignacourt fountains played an important role in keeping the alleys clean and was used by women for their daily washing and to keep their homes clean. Although these women did not have much clothing and household linen, like most Maltese women, they were known to be fussy about keeping their husbands’ and children’s clothing clean. The dominant problem of the Mandraggio was that most of the buildings were far below acceptable standards for habitation. The sun hardly penetrated the labyrinth of narrow alleys and the level of humidity was alarming. Given the cramped living conditions, lack of hygiene and malnourishment, such conditions encouraged the spread of diseases and other ailments connected to substandard living. Although the inhabitants of the Mandraggio suffered under these conditions, the fault lay with the civil authorities, who left these people to live in such misery for some 250 years. Nevertheless, talking to a few elderly people who lived in pre-war Mandraggio, gives a different perception of their simple daily life. Hearing them use phrases like “għalkemm fqar, konna nies sinjuri” (although poor, we were rich) and “fil-Mandraġġ ħadd qatt ma miet bil-ġuħ” (In the Mandraggio, no one ever died of hunger) is really surprising. Women from Valletta were renown to love gold jewellery, and when dressed up for a particular occasion, they wore rings, gold chains, broaches with matching ear-rings and notorious golden bangles or fili, worn around the wrist and high up the forearm to show off their wealth. Some even went as far as to say that the statue of Our Lady of Mount Carmel resembled a Mandraġġara, a woman from the Mandraggio. Due to their great devotion towards the Holy Mother under this title, many devotees implored to her for divine intervention and donated jewellery as votive gifts with which the statue was decorated, especially on its feast day on July 16. 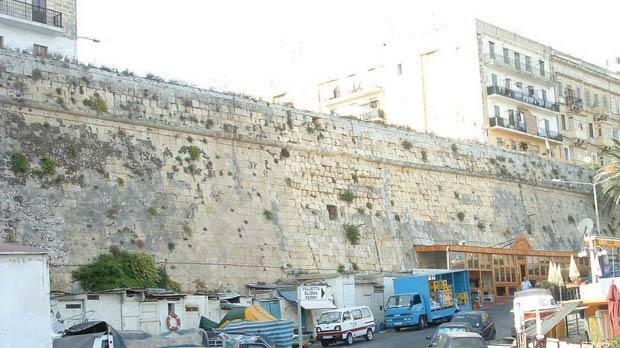 The walled-up breach in the bastion was quite visible prior to restoration works and removal of fishermen’s shacks. Others recalled how strong the role of religion was in their daily life. During the months of May and October, entire families and their neighbours would place chairs and stools outside by their doorways and recite the rosary together. When someone was about to die and a monk was summoned to perform the last rites, people would lay carpets along their path or take out paraffin lamps if it was dark, out of respect towards the Holy Eucharist. And when a death occurred in the Mandraggio these residents were known for their big heart and the entire area would be in mourning. Until the war, the Mandraggio boasted its own midwife, who was responsible for the delivery of most of the neighbourhood’s births. A custom of the locality was that when a woman was about to give birth, some of her neighbours would stand near her front door and pray for a safe delivery. Even after she gave birth, some would share their cooking with her family until she was fit enough to look after the house again. During the turbulent years of World War II, the Mandraggio received its fair share of devastation from aerial bombings and many houses were destroyed. Many found refuge in the rock-hewn shelters under the fortifications by the sea at Marsamxett. Others sought the security offered by the crypt beneath the church of St Augustine and the shelter beneath. But there were others who were stubborn and refused to leave their homes at all cost. In the general elections of 1947, the Labour Party under Paul Boffa was elected in government for the first time. The young architect Duminku Mintoff was entrusted with the Ministry of Public Works and Reconstruction. At the top of Mintoff’s list of priorities was a project to demolish the entire Mangraggio and replace it with modern social housing. The architectural firm B. Harrison and R. Pearce Hubbard were commissioned for the project following a study they had produced some two years earlier, entitled ‘Valletta and the Three Cities: A report to accompany the Outline Plan’. Some inhabitants objected to the plan and strongly resisted, as not everyone appreciated or understood what this change would mean, and on one occasion the police had to intervene due to a personal threat to Mintoff. On another occasion, a group of students from the University of Malta’s Faculty of Architecture were taken on a tour of the Mandraggio, but had to leave after being pelted by some of the residents. One writer went far as to say that there were some who preferred to retain their lifestyle amid the ugliness, filth and squalor that the Mandraggio was known for. Demolition works started in 1949 followed by the construction of flats for men and women who had shared taps and lavatories, sorrow and vice for hundreds of years. 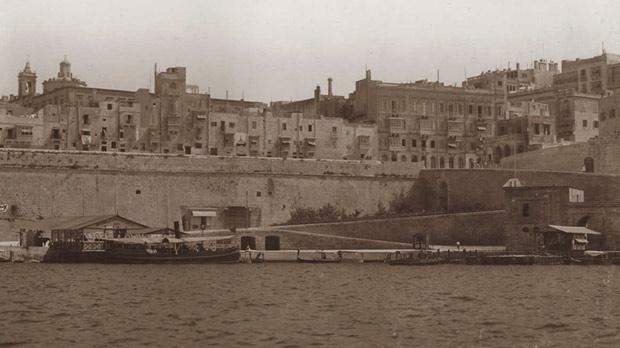 By 1960, the pre-war Mandraggio had been replaced with new residences with one of the best views of Marsamxett harbour. 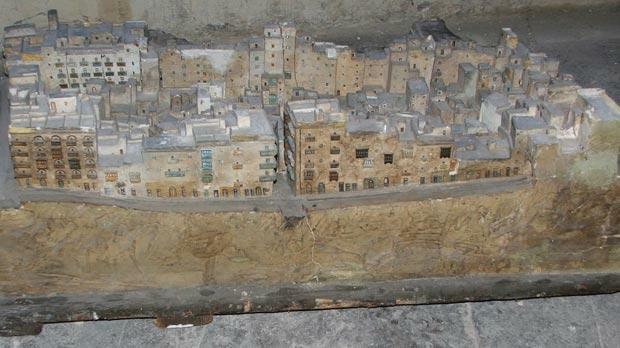 Some time before the demolition and rebuilding project, Rużar Calleja, an employee at the Public Works Department, built a scale model of the old Mandraggio measuring 103cm by 76cm. The model is exhibited at the Museum of Ethnography at the Inquisitors Palace, Vittoriosa. Although the old Mandraggio has gone, at a particular building in Marsamxett Road opposite the junction with Great Siege Road, there is a door covered with corrugated sheeting. It is among the few contemporary dwellings that were retained. Once through this doorway and a short flight of steps, a very small section of the old Mandraggio remains. All the post-war apartments were built at road level; therefore a large part of the old Mandraggio had to be buried with infill, raft foundations laid and the new apartments built above. Unfortunately, the present Mandraggio still carries some of the stigma of the former quarters, even though the modern residents are just like any others throughout Malta. Social and family problems exist everywhere and are not any different from those that affect sections of the population. Maybe there are those who still enjoy tarnishing the name of the Mandraggio. In 1968, the church of St Augustine in Old Bakery Street was elevated to a parish and the Mandraggio fell within its boundaries. Many renowned names have emerged from the Mandraggio, many of whom are now household names. The spectrum varies from doctors, bakers, musicians, local councillors, teachers, athletes, and others. Most of the players of Valletta’s first waterpolo team were from the Mandraggio, and l-Ors and il-Buffalo were the top players. Among carnival enthusiasts who has not heard of Pawlu l-Pampalun or Oscar Curmi? For years, many of the float-builders, dancers and crews came from the Mandraggio. From the Mandraggio came confectioners like Mannarinu Confectionery, known as ta’ Mannaru, Tanti ta’ Tanti Palmier, Cacciattolo l-iSwain, Xmun Borg and his brothers tax-Xelin, Toni Zammit tal-Għawdċi and his son Neriku, is-Sultan, and others. Among musicians, George il-Pusè tops the list. The McKay’s, Agius and the brothers Seychell are renowned names in football, as names like taċ-Ċorma and il-Lolu were for bakeries. Even in the old Mandraggio, there were two well-known doctors – Cremona and Calamatta. Many of the statues of most feasts in Valletta and on Good Friday were primarily carried by men from the Mandraggio. One has to mention the brothers Borg tax-Xelin, who spent decades administering and carrying the processional statues of Our Lady of Mount Carmel and that of Our Lady of Consolation (taċ-Ċintura). These are all names belonging to the post-war era but many earlier others are no longer with us and possibly forgotten. There are very few true Mandraġġari from these earlier years and all are of a venerable age. Some have been interviewed so that their memories may be preserved for posterity. This article is far from being the official history of the Mandraggio, or of the people who were born, lived and died in these quarters. This is only a collection of information and events to help readers understand how life was in this particular area of Valletta which is no longer with us except in its name. First-hand information on the old Mandraggio is not easy to acquire, and it is hoped that this contribution serves as a good reference. Finally, a word to the present generations emerging from this part of Malta’s capital city: cherish the memory of the locality you are from, how it came to be and evolved, as most of them have their roots in the Mandraggio as do part of the foundations of the history of Valletta and of Malta. The author wishes to thank Saviour Grima, R. Ellis & Co., Heritage Malta, the Department of Information, Giovanni Bonello, Victor Scerri and the Zammit and Curmi families for their assistance.